Please feel free to use this graphic to promote the Slow Flowers Movement to your own community of flower farmers, florists and customers. 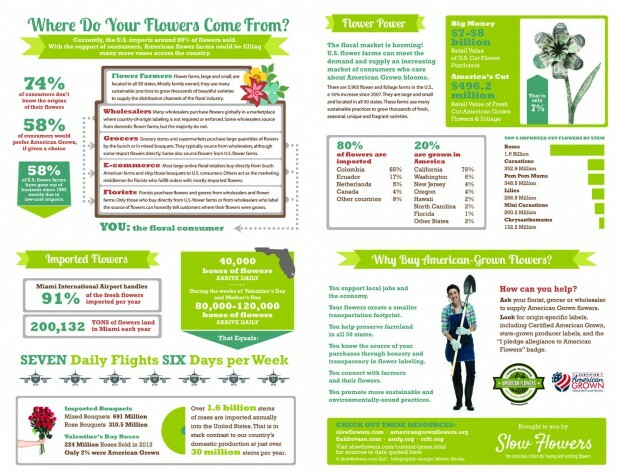 Out of the blue recently, an editor for the American Alliance of Museums’ annual TrendsWatch publication contacted me for permission to reprint the Slow Flowers‘ “Where do your flowers come from?” infographic in the organization’s 2015 annual report. I really had no idea how this illustrious association of cultural institutions planned on using the infographic, but of course, I said YES. The publication just landed in my in-box and I have to say, it’s pretty impressive. Each year, the TrendsWatch report highlights top trends that the Center for the Future of Museums staff and advisors believe are highly significant to museums and their communities. The story of “Slow Flowers” appears in an article titled “Slooow: better a tortoise than a hare,” which highlights slower cultural experiences in all consumer categories. In addition to the Slow Culture section, the TrendsWatch report cited Ethical Consumerism (which has a lot of connections to Slow Flowers, as well), Personalization, Rising Sea Levels, Wearable Technology and Open Data as subjects of importance to the Museum community. 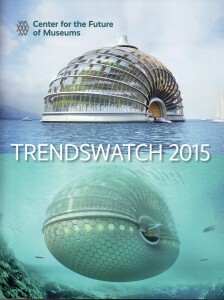 Here’s a PDF of the article: Trendswatch 2015. You can download a PDF of the entire TrendsWatch report here after completing a short registration form. This entry was posted on Sunday, April 5th, 2015 at 1:34 pm	and is filed under American Grown, Blog Posts, Creativity, Flower Farming, General, Slowflowers.com the Directory of American Flowers, Writing. You can follow any responses to this entry through the RSS 2.0 feed. You can leave a response, or trackback from your own site.